The Great 2014 Dinosaur Gift Guide: Volume 1! Though any time of year is the right time to bestow a saurian gift upon a friend or loved one, this time of year seems to put special focus on gift-giving. I'm not sure why. In the interest of helping people find unique and inspiring dinosaur gifts, I've put together this guide. 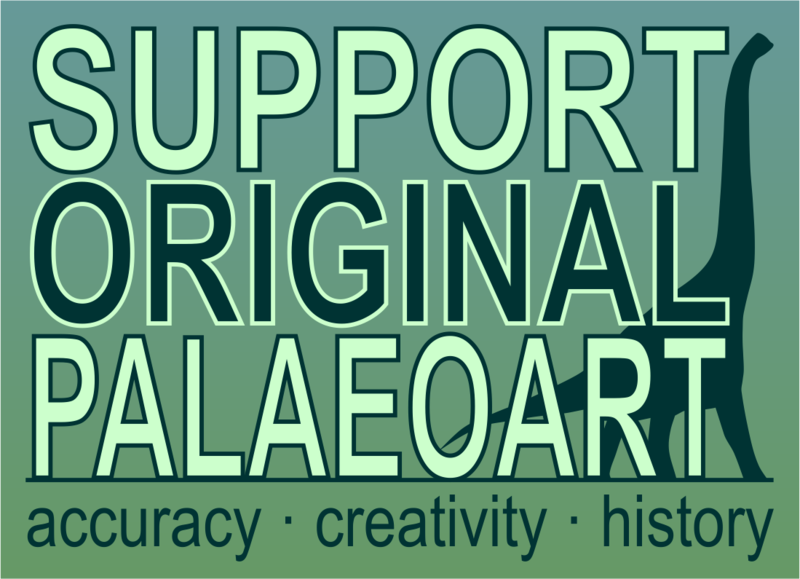 It's certainly not meant to be comprehensive, but rather is an attempt help you choose gifts that both delight their recipient and support the forward progress of paleontology. One easy and meaningful way to do that is to support artists who care about how distant chapters of life's story are presented, and work hard to research their subjects and depict them in novel ways. 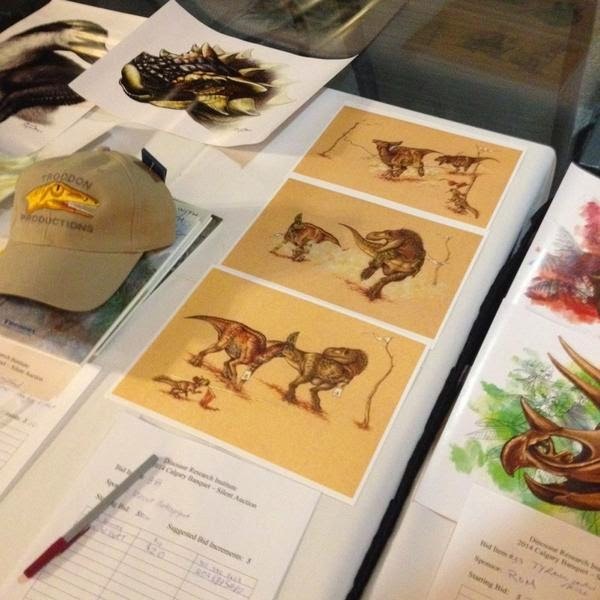 Also deserving of support are the publishers who commission said artists and dedicated shops who specialize in dinosaurs, such as Everything Dinosaur and Dan's Dinosaurs. What I especially love about the Dan's Dinosaurs is that they work directly with artists, so there are a number of links below that lead to their site - if you're looking to wow someone with original artworks or excellent sculptures, it's a great place to start. Andy Farke at the Integrative Paleontologists had a similar post idea, and beat me to the punch. Be sure to read his gift guide over there. Since this was already mostly written up, and there are a few differences, I figured I'd go ahead and post mine, as well. It's so packed with sweet goodies, I'll be splitting it in two, with the second half queued up for Monday. Stenopterygius Palaeoplushie by Rebecca Groom, available at Etsy. Rebecca Groom's work has been steadily growing in popularity, and for good reason. She crafts some of the finest plush prehistoric critters I've seen (and you don't have to rely on my opinion - her Velociraptor Kickstarter was a resounding success). Her Palaeoplushies are available in limited supply at her Etsy shop, with a larger range at Dan's Dinosaurs. Rebecca also designed a heraldic Microraptor that would be welcome in any enthusiast's wardrobe. Velociraptor portrait by Angela Connor, available at her Redbubble shop. Angela Connor has popped up here before when I included her Paleo Portraits series in a Mesozoic Miscellany post. I love the simplicity and charm of the project, putting special focus on the "soul" of the animals, if I may be so woo-woo. 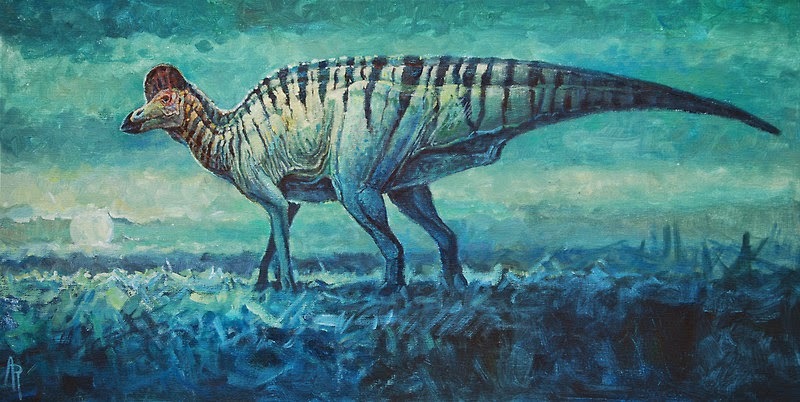 Stegoceras validum by Matt Martyniuk, available as a print from his DeviantArt store. Matt Martyniuk is no stranger to readers of this blog, as a whip-smart researcher and terrific illustrator. His book projects would be especially inspiring to the paleontology prodigies in your life. His A Field Guide to Mesozoic Birds and Other Winged Dinosaurs came out in 2012, and this year he released his first Beasts of Antiquity title. 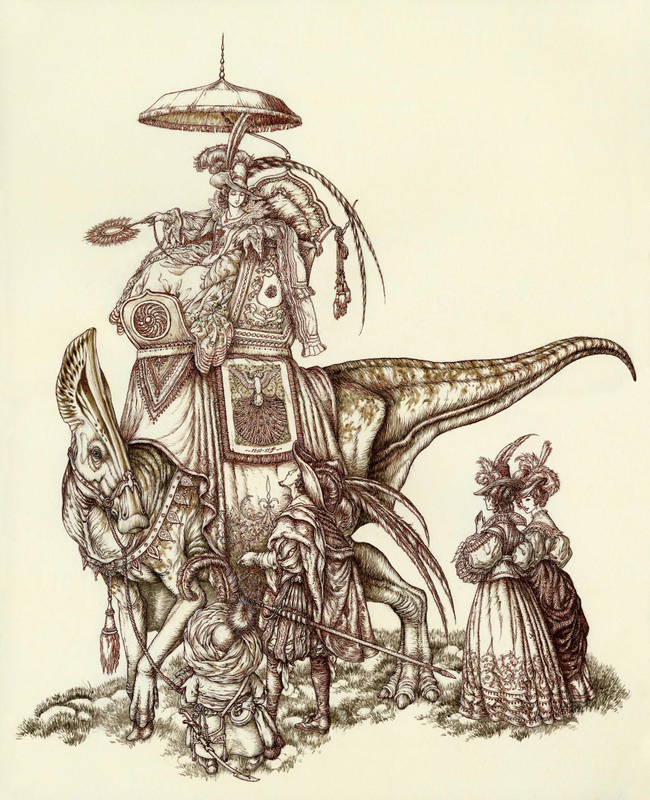 Matt also sells prints at his DeviantArt page, my favorites of which reimagine classic natural history illustration styles of the 18th and 19th century with modern knowledge of dinosaurs: as if an Audubon stepped into the Mesozoic. Tempest Tricera by Sharon Wegner-Larson, available from her Redbubble shop or Etsy. 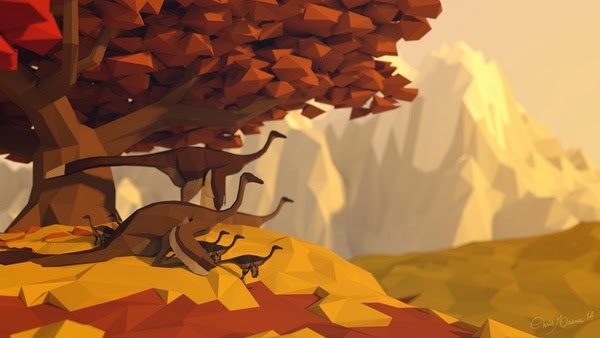 Sharon Wegner-Larson's Synapsid Sunrise was one of the delights of our All Yesterdays Contest back in 2013. Her paleo-themed fabric designs such are wonderful (see the full set here), as are her watercolors of sea life and Mesozoic megafauna such as the incredible Triceratops shared above. Her Redbubble shop has two of her pieces, and you can currently purchase pillows, paintings, and prints in her Etsy Store. 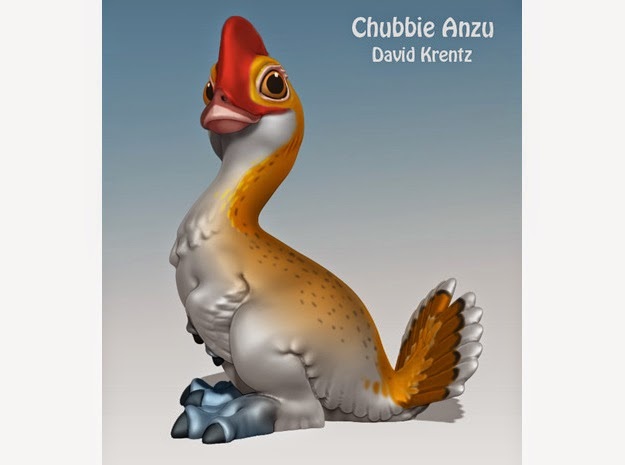 Chubbie Anzu by David Krentz, from his Shapeways store. David Krentz is also a fixture in the online paleo community, a jack-of-all trades who nonetheless seems to be a master of all. He has a Shapeways shop where you can purchase his sculptures (ranging from realistic to the fanciful like the Anzu shared above), and Dan's Dinosaurs sells his work as well. For the budding paleoartists in your life, the Krentz Presentz: Drawing Tyrannosaurus Rex DVD available from Dan's Dinosaurs would be an ideal choice. As if that wasn't enough, David has some really fun designs available on tees in his Redbubble shop. 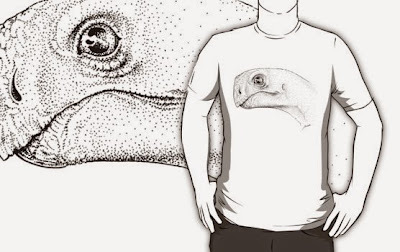 Oviraptorid tee shirt by Jaime Headden, available from Redbubble. Jaime Headden's illustrates intricately stippled skulls and life restorations, and would be perfect for those who admire the simple elegance of skeletal anatomy. 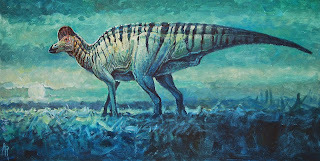 Prairie Moon Corythosaurus (original painting) by Angie Rodrigues, available from Dan's Dinosaurs. Angie Rodrigues hasn't been very active lately, but is one of my perennial favorites. 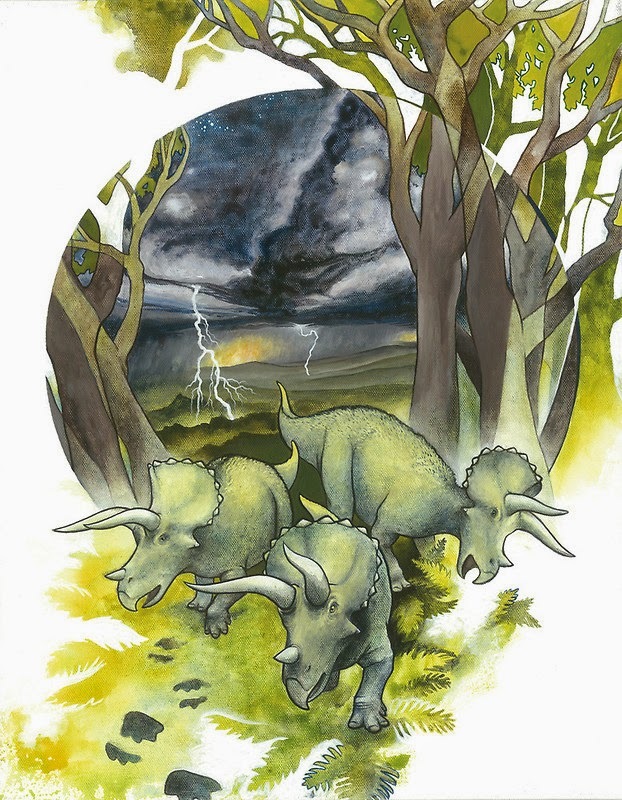 Her originals are featured at Dan's Dinosaurs, and for those who can't quite spend that much, she's got prints available at her own Redbubble shop and DeviantArt, including Triceratops: Autumn Refuge and Fly Away, featuring Iguanodon and Iberomesornis. 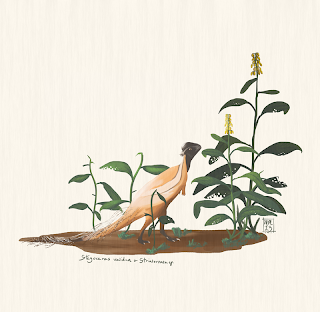 Ornithomimosaurs in autumn, available from Chris Masnaghetti's Society 6 page. Christian Masnaghetti's work has impressed me for a while, and he keeps pushing himself stylistically and technically (I love his recent "Spino-potamus"). Purchase his prints at Society 6 and Redbubble. I also interviewed him a couple years ago, so check out more of his stuff there. Stay tuned for the second half on Monday, which includes much more artwork as well as a number of books to stock the shelves of the dinosaur enthusiasts in your life (surely you know dozens). 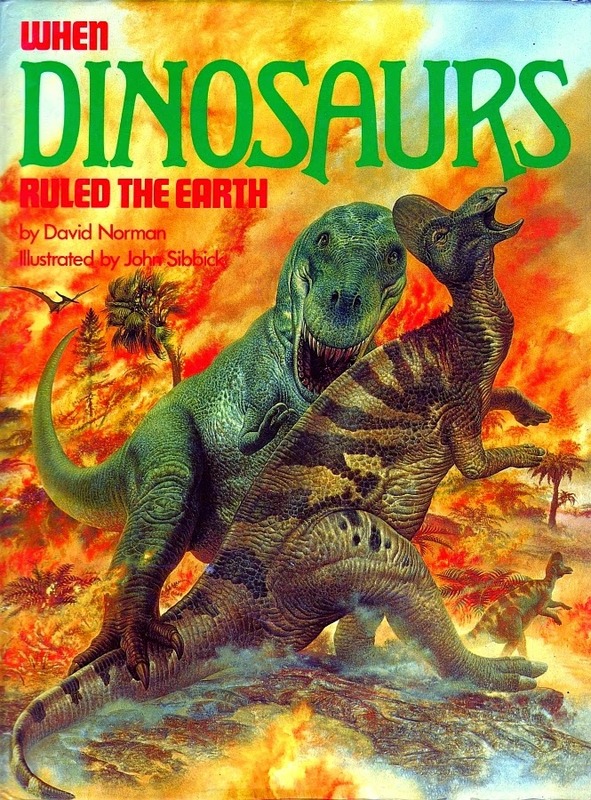 With 1980s-style dinosaurs once again grabbing everyone's attention, thanks to the recent trailer for the long-delayed instalment of a certain cinematic franchise, it's only fitting that my latest book is a seminal specimen from the era. Hailing from around the same time as the Normanpedia,WHEN DINOSAURS RULED THE EARTH (which absolutely must be written in all-caps) sees Norman and Sibbick team up again, but this time the results are a little more fun (while avoiding anachronistic humans and dinosaurs made up by Ray Harryhausen). The cover says it all. ThinkGeek, the popular on-line retailer specializing in, appropriately enough, geeky gifts, recently began selling fossils. This resulted in criticism from paleontologists, and eventually ThinkGeek's decision to halt the sales, at least for a time. Lee Hall posted about the controversy at Extinct Los Angeles, following his original post with a ThinkGeek reply, and his subsequent response. At Jersey Boys Hunt Dinosaurs - as well as her blog Shaman of the Atheistic Sciences, Lisa Buckley has shared her opinions on how to best approach the collecting of fossils. At i09, Artiofab wrote a series of posts on the issue - here, here, and here. Emily Graslie weighed in at the Brain Scoop blog. The American Association of Applied Paleontological Sciences issued a press release supporting ThinkGeek for selling fossils [PDF]. At Dinosaur Postcards, Denver Fowler writes about some intruguing early 20th century photo postcards which seem to show paleontological work in the Morrison Formation. It looks like Kansas has its very own bona fide Mosasaurus, after a history of taxonomic reassignments found putative specimens placed in other genera. Anthony Maltese gives you the low down. 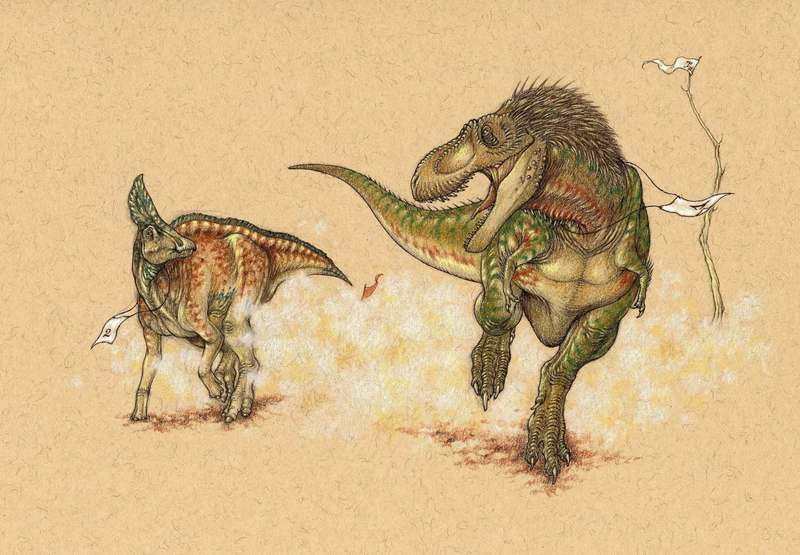 Over at Art Evolved, Herman is back with more dinosaur book reviews, offering a positive look at Sloan's Feathered Dinosaurs and a less glowing review of the infamous How to Keep Dinosaurs. Mark Witton is selling prints! Learn about the less-publicized dangers of paleontology at Mary Anning's Revenge. On the lastest episode of the TetZoo podcast, John and Darren offer a great tribute to Eleanor Kish, who recently passed away - in addition to discussions on the Shanklin croc, bird behavior, and the proud tradition of paleontologists giving lousy advice to artists. Thanks for the shout-out to Marc's 2013 post on Kish, guys! 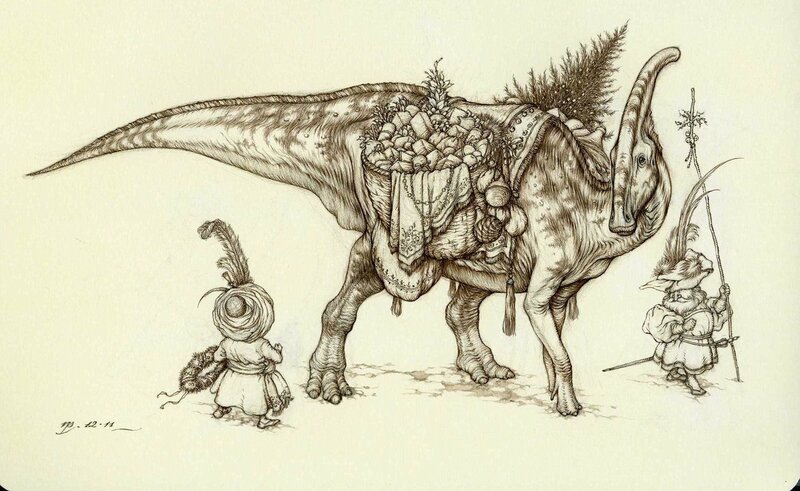 James Gurney is on Soundcloud, and has been posting Dinotopia audio-books. episodes one and two are currently available. Expect a new chapter every Tuesday for the next three months or so. Gurney writes about the project at the Gurney Journey blog. On the Dinologue Youtube channel, Brian Switek discusses the Carnegie Dinosaur Quarry at Dinosaur National Monument. Paul Barrett writes about the Natural History Museum in London's unveiled a new Stegosaurus at New Views on Old Bones. It's the most complete specimen ever found and once it goes on public display on December 4, should be quite a centerpiece for their collection. At Antediluvian Salad, Duane Nash writes about a visit to Big Sur, musing on redwoods living at the extreme edge of their range, the history of the taxon, and their use in environments in paleoart. Jurassic World's teaser trailer is set to debut on Thursday, but since this is the way the world works now, there is a teaser trailer for the teaser trailer. Edited: Well, that was quick. Here's the whole trailer, two days early. In-depth analysis to come! At 10,000 Birds, Larry Jordan writes about the Peregrine Falcon's use of tree cavities for nesting sites and shares a video of a peregrine taking on a brown pelican. I'm not going to pretend to get the whole Pokemon thing, but DeviantArt recently profiled RJ Palmer, who illustrated the realistic Pokemon series, about his dinosaur obsession and the way it informs his work. They're pretty great, and in the interview RJ gives props to some other great illustrators, including official friend of LITC Paul Heaston. Check it out (er, catch 'em all)! 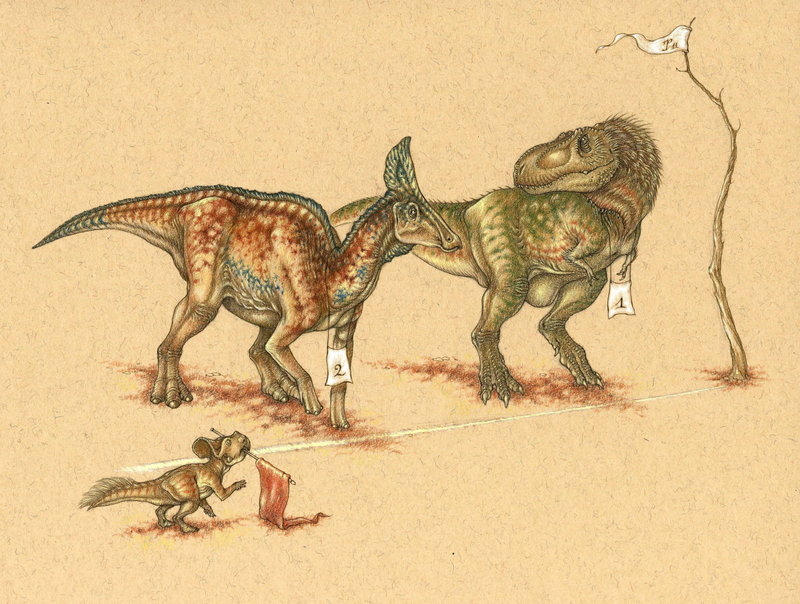 Three years later, the resulting set of three illustrations -- a race between an Olorotitan and a Tarbosaurus -- was finally published in the press release for a study of hadrosaur locomotion by Dr. Phil Currie and Scott Persons, which I expect a number of our readers are already familiar with, either independently or via the Chasmosaurs Facebook page. There is also a podcast about the research. Here, for your delectation and privilege (or indeed indifference and ennui, so please you) are the illustrations at a much larger size, which can be opened out in a new tab/window for full-view if you wish. Much of the comic expression in the dinosaurs' eyes are missed in reduction -- something which I hadn't accounted for when I drew them. The Aesop analogy subsequently repeated in the article was one which had actually occurred to Scott as a result of my original submission, as quoted in my linked Himmapaanensis post above: '...this is a charming twist (and one I had not anticipated). I like it very much!' I readily confess that my simple little ego was considerably flattered by this. 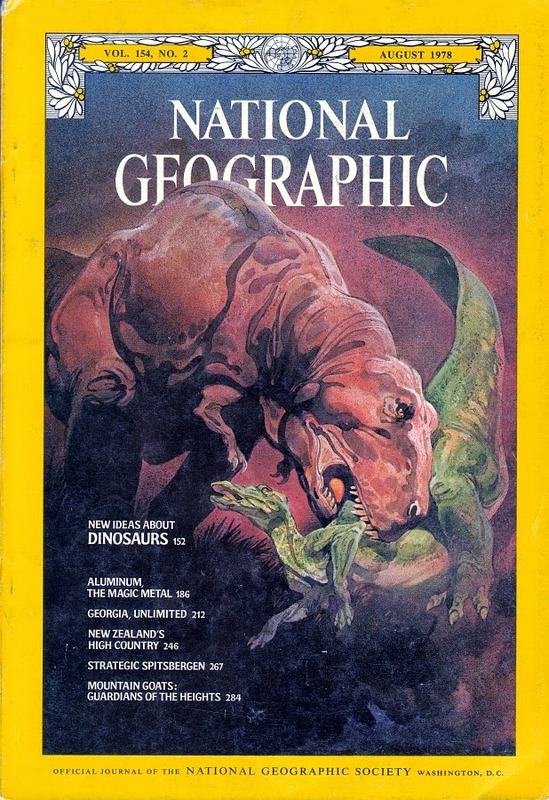 Anyone who knows the slightest thing about the history of dinosaur science will tell you that the '60s and '70s constituted a pivotal period - the 'Dinosaur Renaissance', during which the old ideas about dinosaurs being 'great fossil lizards' (as John McLoughlin memorably put it) were overturned, and a new, more exciting picture emerged. In August 1978, National Geographic published an article by none other than John Ostrom, the man who named Deinonychus and helped lead this new wave in palaeontology. Accompanying the article were a series of paintings by Roy Andersen, and they provide a wonderful insight into how the palaeoart of the time still owed a great deal to the past, even as artists strove to capture something of the Renaissance. Vintana sertichi is a new Gondwanatherian mammal from Madagascar, and in expanding our knowledge of the clade beyond assorted jaw-y and tooth-y bits, it's a pretty significant discovery. It's one of the largest mesozoic mammals discovered, coming in second to the mighty Repenomamus. 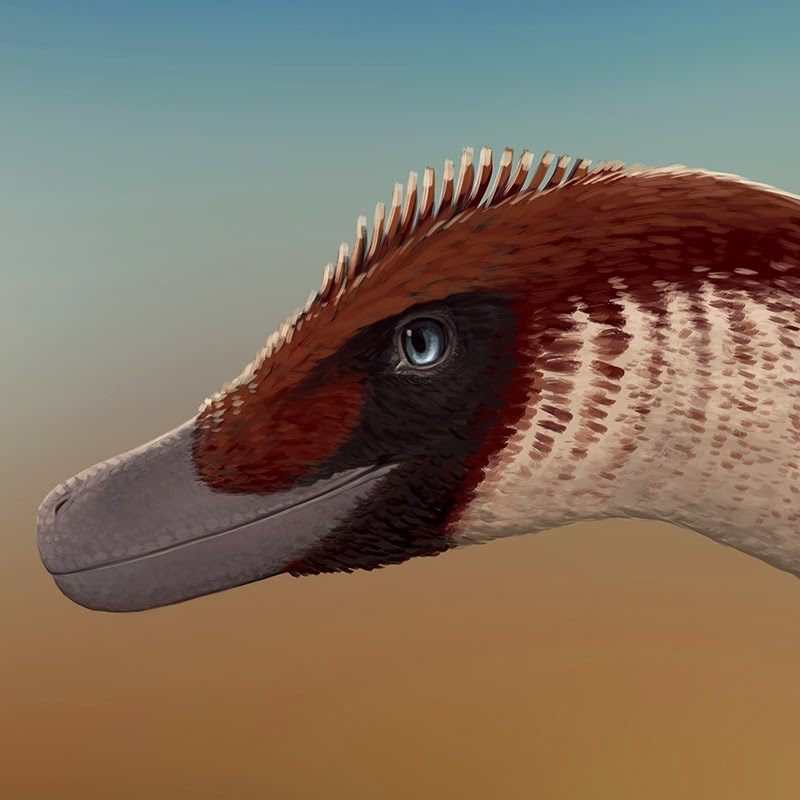 More on V. sertichi from the New York Times, NSF, National Geographic, Palaeoblog, and the Guardian. Last time around, I'd intended to include another new ankylosaur with a generic name starting with "Z" (the previous being Ziapelta). But that other splashy new research distracted me. So, I'm making up for it now. Zaraapelta is a new ankylosaurid from the Nemegt formation in Mongolia. Danielle Dufault created a gorgeous illustration for the press release, so be sure to gaze on its splendor. And be sure to read the post on it at Everything Dinosaur. John Hutchinson, who has given us so much insight by showing the contents of his freezer, has had a dreadful health scare. He wrote an affecting post about his adversity, which I can't recommend highly enough. At DinoGoss, more cathartic ranting against crappy practices in paleo-toys. This time, Matt is training the crosshairs on the toy industry'penchant for rip-offs. 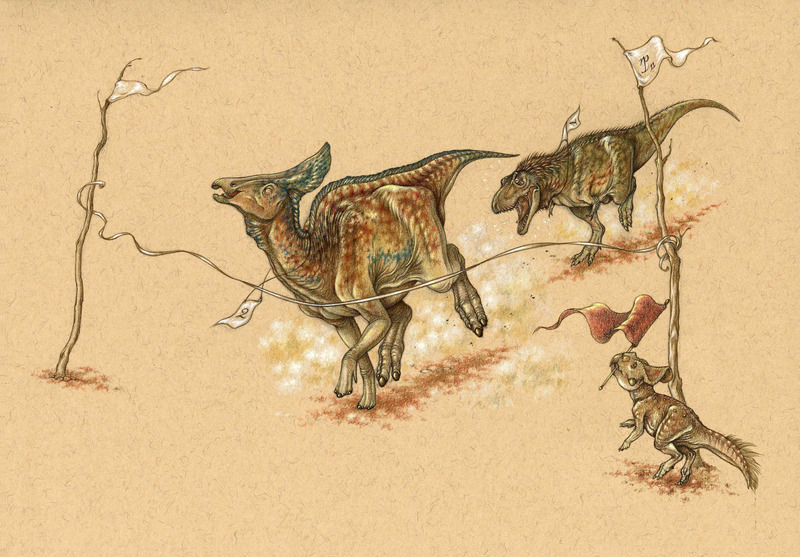 Fans of the spaghetti-necked Tanystropheus, hie thee to Nobu Tamura's Paleoexhibit blog. Necks lie! And SV-POW tells all. Pete Von Sholly had a bit of fun at the expense of people who allow their canine companions to defecate willy-nilly. At TetZoo, Darren has begun writing a series on phytosaurs. Rebecca Groom wrote about a plush Elginerpeton at the Dino Toy blog. I used to do occasional posts on those living theropods we like to call "birds," and I've decided it would be a great idea to bring it back as part of the Mesozoic Miscellany Series. For the first one, I'll strongly urge you to visit Tony Martin's Life Traces of the Georgia Coast blog for a ghoulish story of a decapitated gull. I mentioned the new "Z" ankylosaurs up above, so this led me to decide on Sydney Mohr, creator of the first reconstruction of Ziapelta, for this round-up's paleoart feature. Here is a terrific piece called "Campanian Scene." Check out more of Sydney's work at DeviantArt. Illustration © Sydney Mohr, used with permission.